For those of us who celebrate Christmas, the 25th of December – more than any other date in the year – causes us to think back on past Christmases. Apart from the obvious religious significance, I think that each person who celebrates Christmas grows up with traditions that they believe are universal, only to discover that classmates and next-door neighbours do things slightly differently. When I was a child, every December my father would move one of the lounge chairs into the spare room and bring in the big potted tree from outside. My mother would wrap Christmas paper around the rusty tub it stood in, and we knew that the magical time of Christmas was on its way. The school year always ended on a Friday and from the first Monday of the holidays we began to decorate the tree in earnest. We must have had a ghastly collection of child-made decorations that we churned out during the last few weeks of school, along with a few glitter-strewn paint-daubed or crayoned… er… things that we felt were Christmassy. My parents indulged us, but were probably relieved once the more badly-made ones fell apart and had to be replaced with much better ones bought from a shop. One year, the tree itself had to be replaced because my sister developed an allergy from the leaves and wasn’t allowed to touch it. Not a problem – it was the 1960s so there was a great new tradition of bright green, symmetrical plastic and wire trees that could be bought instead of the real thing, so we quickly jumped on that bandwagon. A few nights before Christmas the dining room door was closed and we could hear much wrapping of presents inside, but the gifts weren’t put out under the tree until just before we went to bed on Christmas Eve. My mother had an annoying habit of putting sticky-tape over the little gift tags that opened like small cards, so that our fingers couldn’t pry them open for us to see who was getting what. We were absolutely not allowed to prod, shake or poke any presents that had our names on. Or anyone else’s presents, for that matter. We were packed off to bed after the usual reading of The Night Before Christmas and despite high expectations of Santa’s visit, with the best will in the world we never managed to stay awake to see him come down the chimney. He must have done because in the early hours of the next morning there was always a parcel on the foot of each of our beds. How did he do that?! Once our parents woke up, we had a quick breakfast and left for church with our mother while our father did the necessary preparation of the Cornish hen, then fetched our grandfather (along with Grandpa’s current girlfriend) and any other stray relatives, in time for the big lunch. All this eating activity (or maybe it was the heat) seemed to wear out the adults because after Christmas lunch they all became drowsy and had to stretch out on sofas and (more annoyingly) on our beds because our childhood bedroom had the glorious afternoon sun. Children were banished to the garden where we met neighbours and played with new dolls, train sets, tricycles or bicycles and – of course – books! Later in the afternoon once the adults had revived, we did the annual stuffing of our cake-holes with Christmas cake, mince pies and a vast array of sweets and nuts that my mother had managed to stash away from us for who knew how many weeks, and then the relatives were taken home. As the day turned to evening, we prepared for a cold chicken supper with another family of friends. I don’t know when that tradition started, but each year we alternated – one year at their house and the next at ours. It was always the perfect winding down, relaxing time and my overriding memory is that there was lots of laughter. Within a few days after Christmas we usually packed up for two weeks down the coast at a big family hotel that we returned to year after year until it got too expensive. Or perhaps it was because we got too big to share a family room? 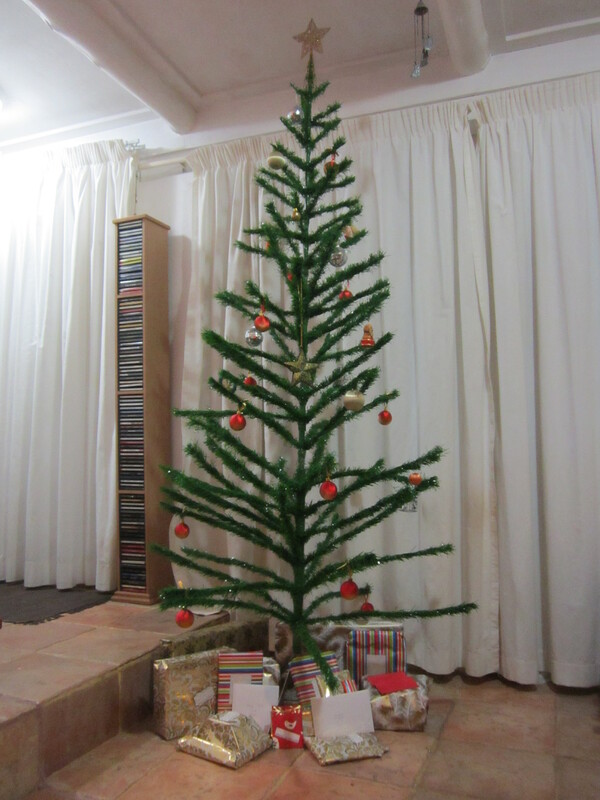 By the time we returned home in January, the tree looked drab and out of place so it was taken apart and packed away. A few days later, the preparations began for another gruelling year of school before we could all have fun again at the next Christmas. My family’s traditions have changed a bit over the years, but the memories are as vivid as ever at this time of year. Unlike Scrooge, I enjoy the visits from the ghosts of Christmas Past. What are your favourite memories of family and holiday traditions? And do you still follow the same ones that you grew up with? This entry was posted in Susan Roberts and tagged Christmas, Christmas tree, eating, family, holiday, presents, Santa Claus, traditions.